I know, “More Star Tours Jon?”. Yes. All Day. Every Day. sense of accomplishment. 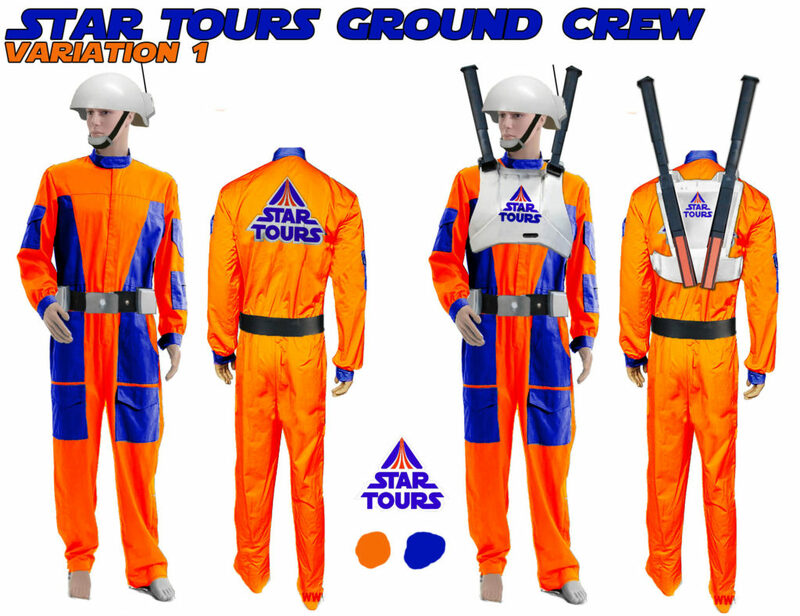 My co-host, Ian, has been wanting to get on the Star Tours costume train, so I started brainstorming. 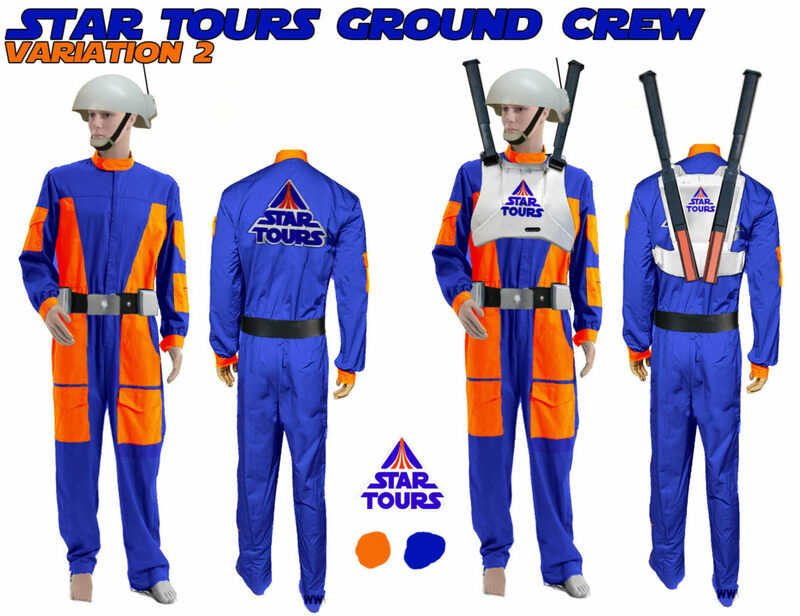 If you haven’t already, check out my other two Star Tours costume builds <Here> and <Here>. The last costumes I made required a very specific orange fabric. A particular shade and a particular material. If you got up close to the two costumes pictured above, you would see the difference in the two orange fabrics I used. That’s the problem with getting bolts of fabric from a discount fabric shop that sells factory seconds and is two hours from your house, sometimes, no matter how hard you try, the fabric doesn’t always match perfectly. The tan flight suit is a little Ghostbuster-y and the brownish one is a little Rose Tico-y. So that leaves the orange one. Besides I’ve already made a Rose Tico Costume (I never posted the finished pictures and I haven’t asked permission to post her pictures…yet…). I’m not going to make just a generic X-Wing pilot. That’s boring and the pattern isn’t super screen accurate. So what am I going to do? Think about all those men and women running around on the tarmac with your luggage, the folks on aircraft carriers strapping things on to fighter planes, or even those off-white uniformed Rebel Technicians on Yavin IV. Mostly the Rebel Techs here though. Now I know this sounds awesome. Totally legit. Original. But, you must always remember that if I didn’t have around 4 yards of orange fabric taking up space, I probably would be working on something else, probably more blasters (I picked up 2 more Rubie’s E-11s for $2.99 each on clearance after Halloween). 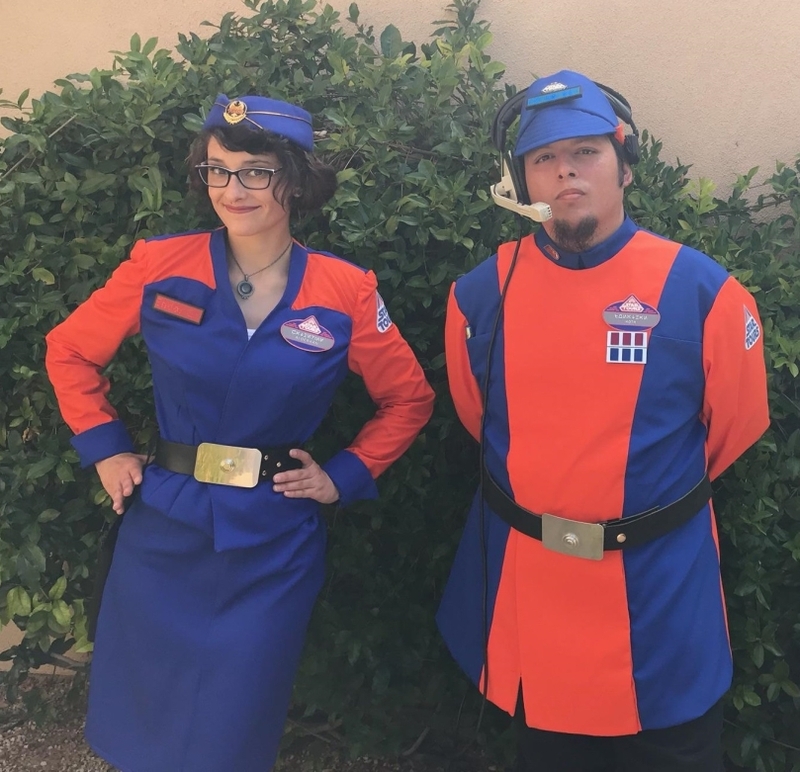 The funnest part of this costume is figuring out how to take an existing Star Wars costume and give it the Star Tours treatment. This is pretty simple. Take the existing uniform and make it orange and blue. Easy. But what combination of those two colors? What other accessories to make it uniquely Star Tours? All three variations I came up with have two items in common. The jump suit and the Rebel Tech Helmet. The first two variations were intended to use the Imperial Ground Crew armor from Rogue One. The scale in the images below on that armor is a little off. 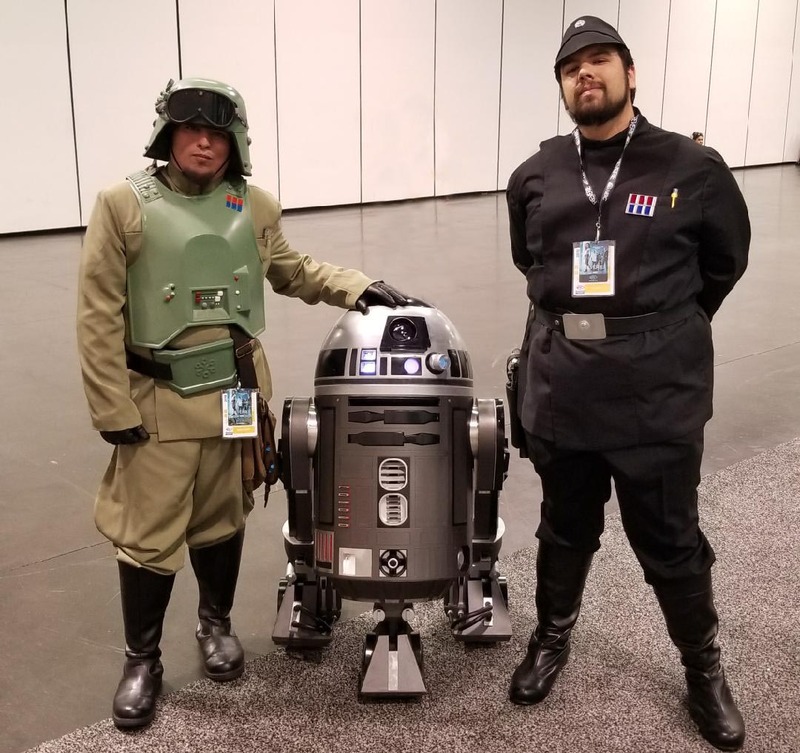 The chest armor I used in this image is actually a Rogue One Tank Driver set just because I didn’t want to try to recolor the ground crew armor (which is similar). The back armor/Baton holders aren’t to scale. it seems that the armor for R1 was specifically made for Felicity Jones sized people and not a 6’+ person. So it looks a little wonky here. Even though I said this was mostly a way to get rid of orange fabric, I wanted to see what it would look like if I reversed the color palette. its difficult to realistically recolor something colored, to white. if there is, let me know. Kind of an anti-climax, huh? OK, I hear you. The idea here is to take the vest that Bodhi wears in R1 and hope to remove ALL color from it, then go back in and recolor it in theme with Star Tours. It looks a little plain at the moment, but there are a ton of small things still to add to it. Tools, harnesses, shoes… I will need to spend some time researching what equipment flight deck ops sailors use and how I Star Wars that up. And to top it off the survival vest they used for the movie is available for around $50. If all goes well, this will premier at Anahiem Wondercon ’18. 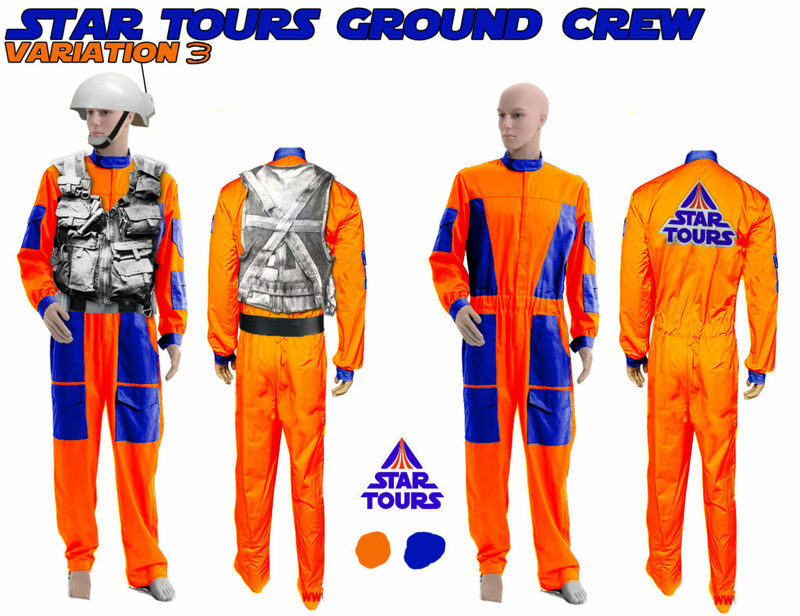 Which gives me way more time than I had on the last two Star Tours Costumes.